After weeks of speculation, Square Enix has confirmed that it is the company behind the mid-January bid to buy out beleaguered U.K. publisher Eidos. The bid was worth $120 million, a significant premium over the Eidos share price at the time of the offer and enough to drive shares to more than double in value in the 24-hour period following. The offer has yet to be approved by shareholders, but a statement from Square Enix noted that Warner Bros., which holds 20 percent of Eidos' shares, is contractually obligated to accept the bid unless it makes a counter-offer of its own. Both Warner Bros. and Square Enix were reportedly readying bids in December 2008, but observers at the time picked Warner as the more likely victor because of the stock it already held. Approval of the Square Enix deal is expected; Eidos CEO Phil Rogers said, "The prospects for the further development of our strategy and the business as a part of Square Enix would offer an exciting opportunity for the Eidos Group," while Wedbush Morgan analyst Michael Pachter called it a "good deal," adding, "It's hard to know what the company is worth, but shareholders are being offered a premium to the most recent stock price, so most will probably believe that the deal is fair." Pachter also noted that raising the Square Enix banner over Eidos likely wouldn't result in any major upheavals at the company. "Square Enix doesn't really have a large Western presence, with blockbusters in the Final Fantasy series, Kingdom Hearts, Dragon Quest, and Star Ocean, but not many 'Western-style' games," he said. "A combination with Eidos gives them a large number of Western-style franchises, with Tomb Raider, Hitman, Championship Manager, potentially Deus Ex." "The total cost is relatively small, essentially the cost of buying a middle of the road developer, so I would say it's a good deal for Square Enix," he added. "My view is that they are buying the company for the existing franchises, so I wouldn't expect to see any of them killed off." Eidos has had a rough ride over the past few years and the company has been in on-again, off-again takeover negotiations since being hammered with a $61 million loss in late 2007. 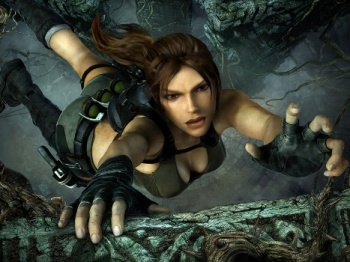 Losses have been piling up since: In January, Eidos was forced to lower its revenue forecast for the fiscal year after Tomb Raider: Underworld failed to sell to expectations, a move which drove the share price down by nearly 30 percent. Square Enix, meanwhile, is having troubles of its own, announcing yesterday that stock in the company had hit a five-year low and that it was postponing the release of its 2008 earnings report.